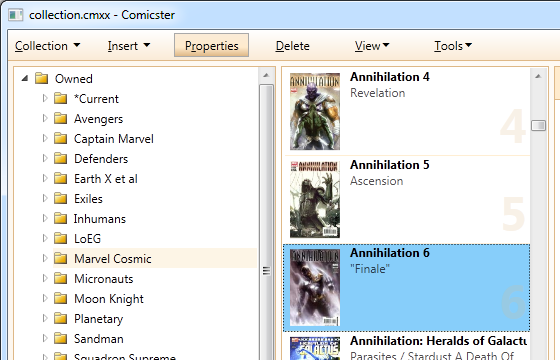 When you click this button, Comicster knows which item you have selected, but needs to create an instance of the corresponding "editor" ViewModel class. For example, if you have selected an Issue (as I have in the screenshot above) then Comicster needs a new IssueEditorViewModel to hand off to the view. To make this easy, I use convention over configuration and a little Autofac magic. So that means that IssueEditorViewModel is registered in the container with that name. First, resolve an instance from the container with the name of the IEditableObject type we've passed in with "EditorViewModel" appended. So now if we pass in an Issue then we'll be asking for IssueEditorViewModel. So far so good. You'll notice, too, that I'm actually asking for an Owned<EditorViewModel> so that Autofac knows that I'll be disposing of it when I'm done (in this case, when the user closes the Properties dialog). ResolveNamed isn't quite smart enough to match the constructor parameters of the type I'm trying to resolve with the ones I passed in, so I'm also giving it a couple of PositionalParameter instances to help it along. That way the CollectionViewModel instance and the IEditableObject that I'm trying to edit will both get passed into the editor ViewModel's constructor. It certainly makes for a simple "ShowProperties" method! The main window of the application responds to any kind of EditorViewModel sent down the message queue by showing a basic dialog with that ViewModel as its DataContext. This is probably a diabolical misuse of Autofac's power, but it makes it really easy to "map" a Model class to its ViewModel equivalent without a messy "if" cascade or dictionary.